It’s New Year's Eve, and you know things are gonna get crazy! It’s finally time to say good riddance to 2016 and ring in 2017 with Bootie’s biggest party of the year, with an epic balloon drop, and champagne toast at midnight! Four rooms of fun for one price! Get tickets now because WE WILL SELL OUT! FREE “Best of Bootie 2016” CDs to the first 300 people! It’s New Year’s Eve … you know it’s gonna get crazy! So drop the attitude, pretense and high expectations, and ring in the New Year with Bootie LA! 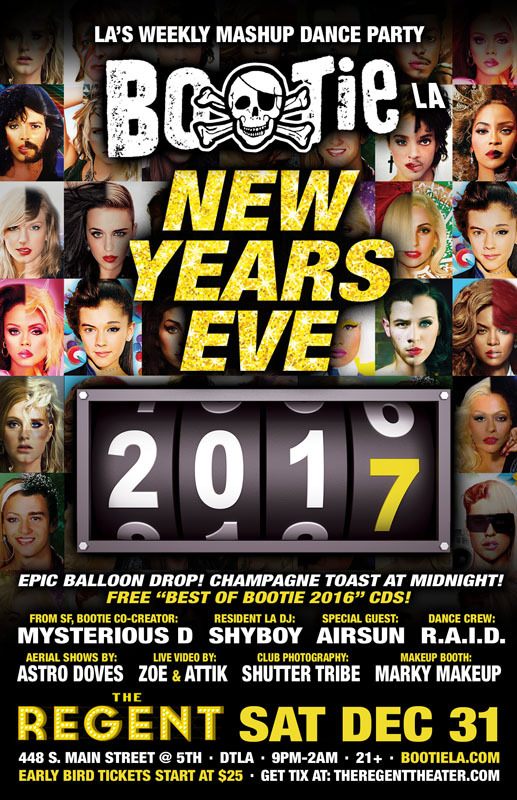 For this special night, Bootie is taking over the Regent Theater with mashup dancing all night long, and of course will be ringing in the New Year with an epic balloon drop and champagne toast at midnight! Bootie co-creator and DJ Mysterious D flies down from San Francisco to join LA resident DJ ShyBoy, along with special guest Airsun from Bootie SF, as they all throw down the best mashups from the past year, keeping you dancing into the New Year. There will be a special performance from Fox Brigade, and resident dance crew R.A.I.D. will help do the countdown to 2017, as well as performing special New Years Eve go-go insanity! Plus, Astro Doves provides acrobatic shenanigans throughout the evening! All this, plus the much-awaited “Best of Bootie 2016” CD — our annual 80-minute mashup mixtape compilation — FREE to the first 300 people through the door. And of course, Marky Makeup will be there to help you sparkly for the big night, while Bootie LA photographers Shutter Tribe will be on hand to capture all your New Year’s Eve glamour and sloppiness!